Should You Be Active On Multiple Social Media Platforms? Can you be both genuine and active if you are on multiple social media platforms? This is the issue Mark Babbitt and I discuss. And we both agree, there are smart ways to use social media for your career growth without investing tons of time and still come across as genuine. This post was inspired by a tweet I got from Scott Berkun. Is it possible to be active on several social media channels and come across as genuine while keeping your sanity? Do you suffer from FOMO (fear of missing out) or worse, NGPTG (not going to play that game)? Finding the right balance of being just active enough will net you many amazing and often unexpected results. New friends, learning new things, exposure to new ideas, and a wee bit of social media savvy. It is no longer advisable NOT to be on social media. I turned to someone I know is active on social media and author of A World Gone Social to get his take on this conundrum- Mark S. Babbitt. Mark is CEO of YouTern, a community that enables young talent to become highly employable by connecting them to internships, mentors and contemporary career advice. Mark is also President of Switch and Shift, a consultancy that champions social leadership, creation of an optimistic workplace and human-centered business models. His newest community, ForwardHeroes.org, will launch in 2017 to help our military veterans transition successfully into civilian careers. He’s an entrepreneur, mentor and leader who, early on, saw social and digital media as not just another way to communicate but as a foundation on which we can build community, demonstrate expertise and launch entire brands, from personal to corporate. When not working to help clients from start-ups to Fortune 100 clients embrace the Social Age, Mark writes for outlets such as Harvard Business Review, Inc.com, Forbes, Huffington Post and Bloomberg News. Which social networks/platforms do you have profiles on? How many do you actively use? How much time do you spend on social a day? Is there a down-side to being on too many social networks? 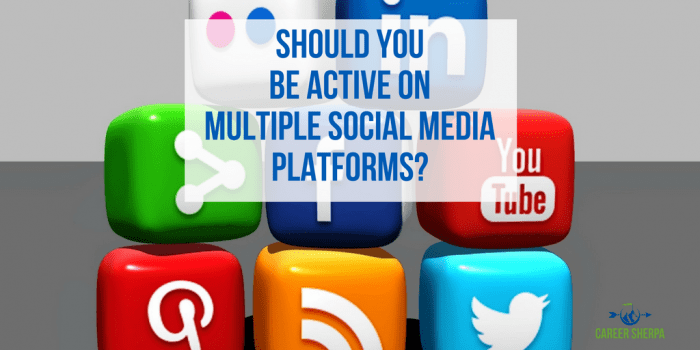 Recap: Should You Be Active On Multiple Social Media Platforms? Once you come up the learning curve, it doesn’t take a lot of time to stay active on multiple social media platforms. You need a plan. Mark said, during an interview with David Burkus’s Work Smarter Summit, that he spends 1/3 of his time composing, 1/3 of his time listening and 1/3 of his time extending the conversation through commenting. Mark has multiple companies as well as his own personal brand and yet he spends a little over an hour a day on social. The answer is…it depends. Obviously, LinkedIn should be mastered first. Facebook, Twitter, Pinterest, and Instagram are the more popular social media platforms right now. Mark and I use them all.